On the Fuse HR & Payroll blog, we’ve talked a lot about the many benefits of a human capital management system for every stage of the employee lifecycle. From hire to retire, an all-in-one HCM System can improve productivity and help your bottom line. But not all of these systems are created equal. Ask any HR Director, and they’ll tell you to do your research before signing a contract. It’s worth understanding the differences between the various products and services out there and knowing how they will work with your organization’s specific needs. At Fuse, our customers are our number one priority. We realize any company can say that, so we go above and beyond to show our customers we actually walk the walk. With over 30 years experience, we build personal relationships with our customers, offering customized experiences to support their organizations and help solve their unique problems. Going head to head against other leading HCM platforms and payroll providers, Fuse consistently ranks at the top. 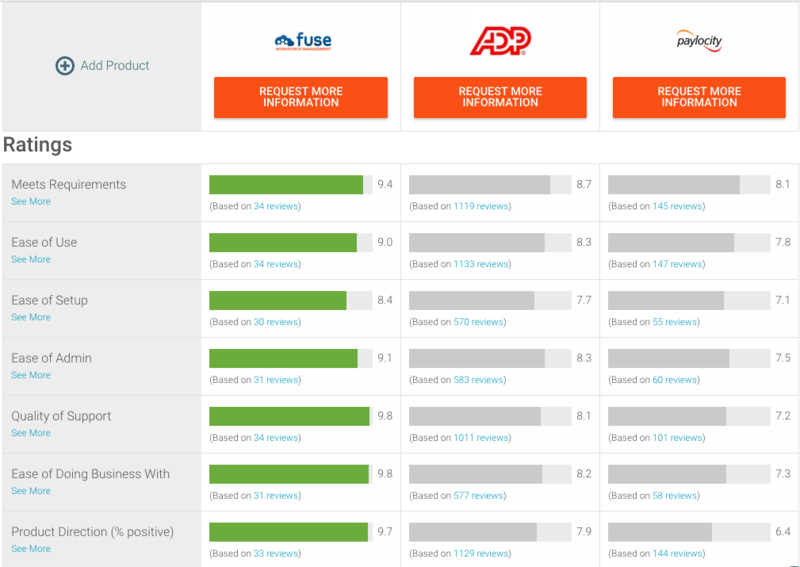 Whether it’s the ease of use, cost savings, or outstanding customer service, customers rate Fuse above the rest. But don’t just take our word for it—you can hear it from our customers themselves. HR and payroll professionals have specific requirements to service their businesses accurately and efficiently. 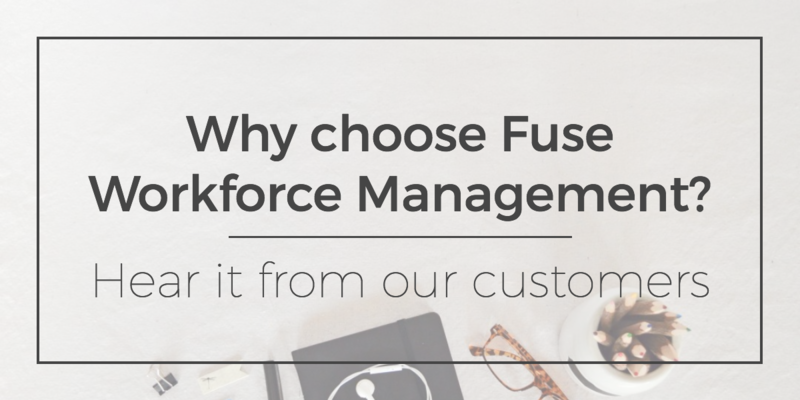 According to our customers, the Fuse system goes above and beyond their expectations for an all-in-one workforce management system. 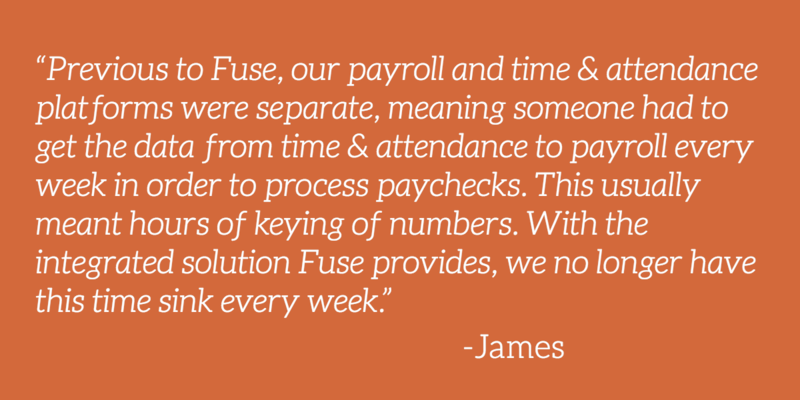 Switching to Fuse has saved customers a lot of time on day-to-day HR and payroll processes. This means they can turn their focus to other parts of the business, namely their employees. Changing providers or processes is never a simple task, but we continue to hear from customers how easy it is to setup the Fuse system and meet implementation deadlines. Once the Fuse system is up and running, users find it simple to navigate and run. Customers often hesitate to switch from their current system, even though it’s not servicing them well, for fear that the cost of changing systems will be too high and productivity will suffer in the process. However, customers say Fuse requires less time to reach ROI than other leading HCM system brands and is more cost-effective than managing HR and Payroll services through manual processes. From time and attendance to benefits administration and salary structures to compliance management, Fuse customers love the various features of the robust system. HR and payroll processes aren’t one-size-fits-all, and our customers will be the first to tell you that. Fuse offers customization to accommodate your specialized reporting or integration needs, whatever you need to accomplish. In fact, users rated Fuse’s customization a 9.5 out of 10 compared to Paylocity’s customization rating by its users of only 5.2! Has your business or nonprofit outgrown Quickbooks? Fuse is great for growing businesses and will scale right along with you. Considering other services or platforms for managing HR and payroll? See what Fuse users have to say about other leading HCM platform services and how Fuse measures up. With Fuse, users save time and money—a benefit for the entire organization. We hear it all too often: HR Directors or Payroll Managers sign a contract for a flashy product from a big name provider, only to find their support and customer service to be a disappointment at best. At Fuse, we don’t merely provide you a system. We put you in control of your service and equip you with the tools and training to manage your workforce with success. We don’t believe in long hold times or unanswered questions. We put our customers first, so you can be sure you’re getting real, valuable support from real people. Just ask our customers! See how an integrated HR and Payroll system can help your organization. One of our HCM System experts will show you how Fuse can help streamline your workforce management with a system customized for your organization. Contact us today!